A poignant and lovingly written ode to an unsung hero. Beautiful and heart-wrenching. This is a short book, but it punches well above its weight. The book, written mostly from the point of view of Fred Sadler, a Canadian veteran of WWI who never quite recovered from the war and spent years in and out of mental institutions (such as they were at the time), takes its readers on a journey through Fred’s memories (he has just died, so I guess I should say his ghost’s memories, but, in many ways, Fred had been a ghost of his former self for many years already) and those of the relatives who attend his funeral. We have brief hints at times of what other characters are thinking or feeling (as Fred’s consciousness becomes all-encompassing), but mostly we remain with Fred. We share in his opinions and his own remembrances of the facts his family members (mostly his sister-in-law, Viola, who is the only one left with first-hand-knowledge of his circumstances, at least some of them) are discussing. 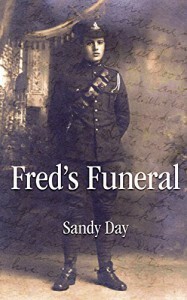 Fred’s story — based on the life of a relative of the author and on documents and letters he left behind— will be familiar to readers interested in the history of the period, and in the terrible consequences the war had on the lives and mental health of many of the young men who fought and suffered in the war. Shell-shock (now known as Post-Traumatic Stress Disorder or PTSD) was little understood at the time and psychiatry (that is not a hard science at its best) was pretty limited in its resources at the time. 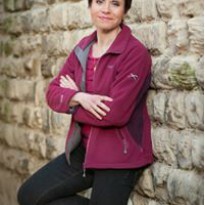 Even nowadays, delayed onset PTSD is rarely diagnosed and not well-understood, and the condition results sometimes in permanent changes in the personality of the sufferer, who might end up with all kinds of other diagnoses and are often misunderstood and mistreated. Sandy Day’s beautifully descriptive and, at times, lyrical writing —the author had previously published a poetry book— captures both strands of the story: the terrible disintegration of the life of such a promising young man, and the changes in his family and the society around him, which he was only a spectator of (and was never allowed to take an active role in). His brother married and had children, his parents died; the family property, so dear to him, was split up and eventually sold, and he was only the weird uncle nobody knew much about. The novel (as it is a fictionalization of the events) succeeds in giving Fred a voice, in bringing forth the fear, the thrashed hopes, the puzzlement, the resignation, the confusion, of this man who put his life on the line and got only pain in return. It is a poignant and beautiful memorial to the lives of many soldiers whose trauma was misunderstood and whose lives were destroyed. The writing is compelling and gets the readers inside of Fred’s head, making us share in his horrifying experiences. The book can be hard to read at times, not so much because of graphic content (although the few descriptions are vivid), but because it is impossible not to empathise and imagine what he must have gone through. But there is also a hopeful note in the interest of the new generations and the fact of the book itself. There are time-shifts, and some changes in point of view (because Fred’s ghost can at times become the equivalent of an omniscient narrator), but past events follow a chronological order and are clearly demarcated and easy to follow, and the device of the funeral helps anchor the story and provide a frame and a background that give it a more personal and intimate dimension. The Canadian landscape and setting also add a touch of realism and singularity to the story. He looks down half-blindly as his old Canadian Expeditionary Force Uniform dissolves into a constellation of colourful snowflakes, twirling away from him in a trail. Beneath the uniform he is nothing. He has no name or age. He is at once as old as a flickering blue base at the wick of a candle and as young as a flame surging into brilliance. This is a poignant and lovingly written ode to a man who returned from WWI (at least in body) but was as lost as many of the men who never came back. A story about an unsung hero that should be cherished and its lessons learnt. I cannot recommend it enough.